In this “Your Town” report we are taking a deep look into Westwood as a whole and looking at sales numbers for 2014 versus 2013, along with how the towns along its borders did, as well as what’s currently on the market in town right now. 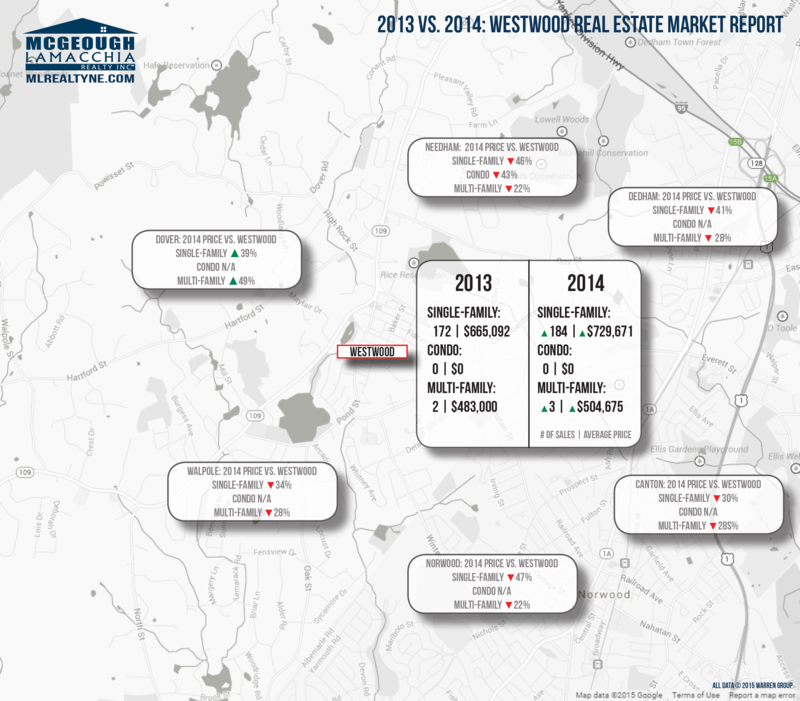 Overall, the housing market remained strong in Westwood in 2014, with a total of 187 homes sold at an average sale price of $617,173. The 187 number includes single-family homes, condominiums, and multi-family homes. That meant a nice increase in the overall average home price, with homes selling for 7% more than in 2013. 13 fewer homes sold in 2014 than in 2013, which is part of a trend that contributed to overall home sales in Massachusetts being down 1% in 2014. Single-Family Homes: 184 sold in 2014 versus 172 in 2013, for an average price of $729,671 which is a big increase from the previous year’s average of $665,092. 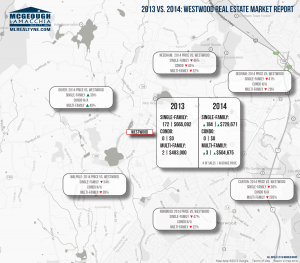 Condominiums: no condominiums sold in either 2013 or 2014 in Westwood. Multi-Family: 3 homes sold in 2014, as opposed to 2 in 2013. The average sale price in 2014 was $504,675, a boost from the previous year’s average price of $483,000. Next, looking at the towns that Westwood shares a border with, we see that the town remains affordable compared to Dover, where a single-family home can cost up to $287,399 more when you look at average sale prices (see graphic above for a breakdown by town). Needham, Dedham, Canton, Norwood, and Walpole come underneath Westwood’s average price for a single-family home by anywhere from 30-47%. As of today, March 5, 2015, there are 28 single-family homes on the market in Westwood, with an average listed price of $1,489,759. 2 condominiums join them, with an average asking price of $549,999, and there are currently no multi-family homes on the market. That is a total of 30 homes on the market, as compared with 37 on the market one year ago today. With interest rates in the 3.75% range right now, and very few houses on the market in Westwood, there are positives for both buyers and sellers — buyers can take advantage of the lower interest rates, and sellers benefit from there being a lower supply, which has resulted in higher prices in many cases. With inventory sure to rise after the current winter storms subside, now is the time to list your home if you are considering doing so, especially with housing inventory levels at their lowest point in 11 years. Westwood is a residential community of 14,618 as of the 2010 US Census. Settled in 1641, the town was founded in 1897 and is located in Norfolk County at the intersections of Routes 95 and 1, making it an excellent commuter location for those working in Boston, which is just a 20-mintue drive away. A variety of open spaces in town, including recreational pond beaches, afford outdoor opportunities, and in-town restaurants and stores give diners options when selecting where to eat and shop. With so much to offer, it’s no wonder that Westwood remains a highly desirable place to live and own a home.